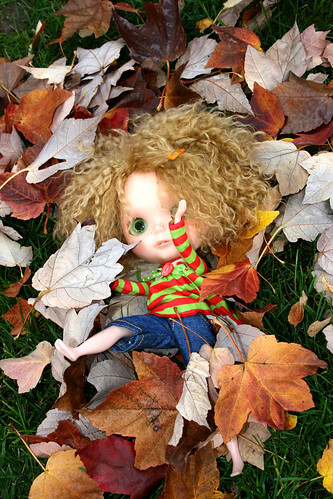 All summer, I was feeling a little guilty about my dolls. I own several dolls *ahem*. However, over the summer, they were literally collecting dust! I was wondering if the interest was a fleeting thing, and prepared myself to start selling some of them. 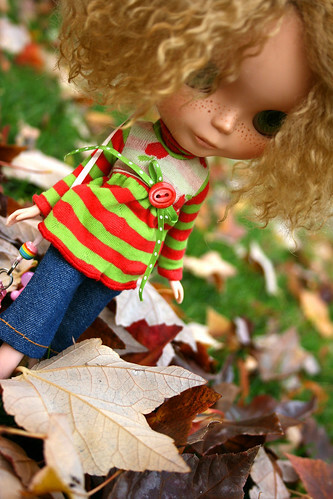 However, the cooler weather arrived, and suddenly, I was ALL about the dolls again. 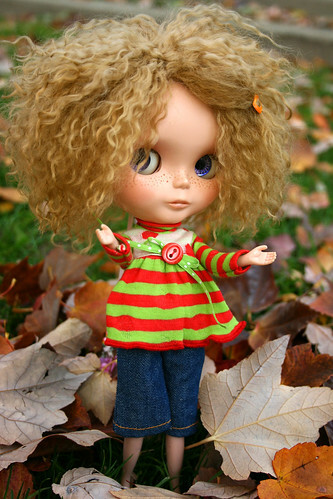 Making little clothes, pulling open their heads and changing their eye colors, and even... buying more dolls! I did end up selling a few of them in order to fund the new ones. 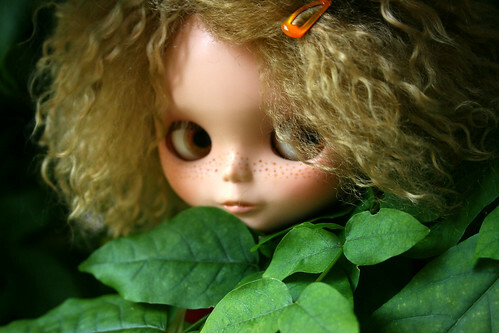 I also customized one of them with the hopes of selling her to make some money, but she was just so cute that I HAD to keep her. There is NO WAY I could send her away! Initially, I wanted to dye her hair bright red and give her bangs, but that was an experiment that did NOT turn out the way I had wanted it to... AT ALL. So, I decided to go crazy with the experimentation, and started carving her lips. 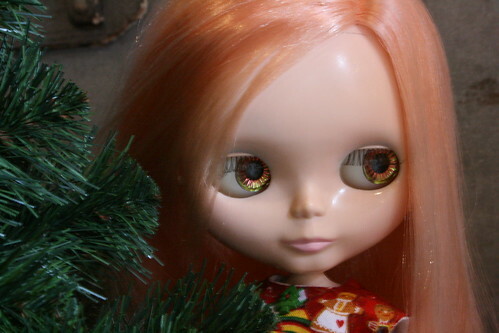 I then took a blank scalp and rooted it with mohair, changed her eye colors, and gave her new makeup. She now looks totally different! Looking back at old pics like the one above sometimes makes me sorry I no longer have the pinkish haired girl... but the new one is ssoooooo cute. I did a silly photo shoot the other day. Her new name is "Apple". "Apple! Where are your shoes???" "I don't KNOW... they could be anywhere, really!" "Um, you're supposed to be looking for your shoes..."
Apple insisted on pushing the elevator button on the way home. She said it was because she KNEW I would do it WRONG. It was fun to give her such a giant makeover, and I enjoy doing silly photostories every once in a while. Now, I am waiting for one of my 'dream dollies' in the mail... a couple of other Blythe collectors and I went in on a yahoo japan auction for 3 used dolls... evidently, Japanese collectors are not too keen on used dolls, so we got them for a steal! When will I stop being cool? I thought about this today, particularly in relation to my job. Currently, I have a nice balance with the kids I work with: I can comfortably joke that I am old and uncool, but the kids still like me and say I'm nice and whatnot. One of them saw me in the hallway today, and darted back and forth in front of me as if to fake like she wasn't going to let me pass. That type of sense of humor is right up my alley, so I darted back and forth, too, and said, "no way, you are never getting past me!" she laughed, and of course I let her 'win'. Will there be a time when I'm too old for that stuff? When the kids will stop relating to me like that? Or, will it just shift to something that's still good, but different? With what I do at work, it is SO IMPORTANT for the kids to see me as someone they can relate to on some level. Will 45 be too old? 55? 65? Oh, jeesh, I hope I am not doing this at 65! I guess maybe I'm leaning toward the idea that it might not be QUITE the same, the joking around might change tone as my skin wrinkles and my hair starts to require color-related intervention, but I'm assuming that my openness and my sense of humor will remain, and maybe the wisdom I earn every year of being on this earth will just add something good to the mix. I haven't written lately, have I! I have had every good intention of taking some photos of the knitting I have been working on, as well as of some of the jewelry I have made lately, but... as my 7th grade teacher told me, "the road to hell is paved with good intentions". I remember being horrified that my 7th grade teacher said "hell" to me... despite what my parents might tell you, I was a very good little girl back then! I sometimes think about what I was like back then, compared to the middle school kids I work with now. I mean, I think the first time I ever said an actual swear in front of my parents, I was over 18. I did my homework, came home within 15 minutes of when my parents told me to, I even did my own laundry by age 12. Not so with a lot of the kids I now know. They are having such a different life experience than I did! Anyway, I am getting off track. The title of this post is referring to the onset of Fall. There have already been a few mornings where I have been able to see my breath on the way to my car, and although my window is still open, I did need to pull a blanket up over my sheet in bed a few times. Flip flops are really not an option any more. I know soon enough that my car window will stop rolling down until perhaps March, and that I'll have to start doing the 'penguin walk' down the icy sidewalks to keep from slipping and falling. I don't always mind the cold weather... if you're dressed for it, it's not really that big a deal. It's the precipitation that annoys me the most; it makes things slippery, makes roads impassable, that sort of thing. Sure, when it is only 4 degrees and windy, I hate the cold for sure... but anything around 30 or above is really no biggie. I hate it when people say, "well, if you don't like the weather, move!" It is such an ignorant oversimplification of why people choose to live where they do. And really - is there anywhere in the world where I would like the weather every single day of the year? Most likely, no. In warm places, it gets waaaay too hot in the summer. Or rains too much. Or has earthquakes. Or devastating hurricanes. Or major political unrest. You get the idea. The reason I live where I do has much more to do with the culture, the history, proximity to friends and family, etc. than it has to do with the weather. I LIKE where I live. I have my own place in an interesting, vibrant city, and have made lots of friends here. I live within an hour of my parents and grandmother. I have a good job that I like. New England is a gorgeous part of the world. In the grand scheme of things, it is quite safe and clean, and I have all of the freedoms I could wish to have. Anyway, a big pooh to those who have chosen to oversimplify things so erroneously. And a cheerful welcome to Fall - I like YOU a lot! It's winter that I frequently feel somewhat ambivalent about!